Substance Abuse Recovery, Rehab, Behavioral and Mental Health Treatment with lasting results. We are here to help! Next Level Recovery offers Alcohol and Drug Rehab, Treatment and Mental Health Counseling. We’ll create a customizable treatment plan to help you with mental wellness or to get and stay sober while maintaining your life, work & family. Next Level Recovery is committed to your wellness plan, independence, sobriety, and long-term recovery from addiction. Your recovery program is built with our “whole-life” approach that includes relationships, career, health and psychological well-being. Next Level Recovery in Utah – Treatment That Works! We are committed to your wellness plan, independence, sobriety and long-term recovery. Our Masters’ level clinicians deliver evidence-based outpatient treatment. Contact Us Today to Get the Help You or Your Loved One Needs! Next Level Recovery is licensed by the State of Utah and is certified by The Joint Commission. The Joint Commission is widely considered the gold standard accrediting agency of the alcohol and drug rehabilitation industry. We integrate and design patient-centered care with a “village” approach. We connect our clients with our powerful team of caring, Master’s level clinicians to provide the most effective therapeutic services and modalities available. Our programs deliver evidence-based techniques, family and relationship support and positive peer-to-peer networking. We routinely collect feedback from our clients to continually improve our services. We partner with Sober Living Properties and offer five sober housing locations. Each home is fully furnished with all the amenities. Our sober living homes in Utah offer a sense of home and structure. Our supportive team facilitates growth and continued recovery through peer-to peer support and life skills acquisition, including the connections needed to vocationally and professionally transition back into the community. Next Level Recovery has a specific program to assist with challenges associated with neurological differences. We support neurodiversity and differences that include: ADHD, Autism Spectrum Disorder (ASD) and more. We utilize Applied Behavioral Analysis (ABA) to deliver well researched treatment applications. Our programs improve the quality of: relationships, social-skills, vocational and professional engagement. Drug Rehab and Alcohol Addiction Treatment in SLC, Utah is Affordable at Next Level Recovery. We give those struggling with drug and alcohol addiction answers, hope, and a positive way forward. If you have tried other programs and relapsed, Next Level Recovery offers a better way. Proven Long Lasting Addiction Treatment results. What are the different types of treatment options available? 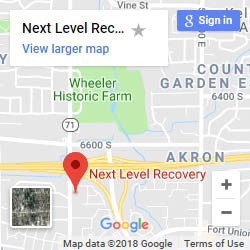 Next Level Recovery offers drug and alcohol rehabilitation in outpatient and inpatient settings, as well as aftercare sober living facilities. Can I go to drug rehab without insurance? Yes, we offer financing options for clients who don’t currently have health insurance coverage. Can you help me if I have a dual diagnosis of mental health issues and addiction? Yes, we specialize in helping individuals battling addiction with common co-occurring issues such as depression, anxiety, bipolar, PTSD, trauma, and personality disorders. Generally speaking, treatment last 1-3 months. The average length of time for addiction treatment varies depending on if the client has inpatient or outpatient services, and on the individuals; distinct treatment needs. Will insurance cover drug rehab? Insurance usually covers mental health services and may cover some addiction treatment services. Call us and we will check your benefits for you and help make recovery as cost effective as possible. Will Medicare or Medicaid pay for drug rehab? Unfortunately, Medicare or Medicaid will not pay for drug rehab. We can provide financing options and treatment solutions for you or your loved one. Please call us 24/7 to obtain more information regarding your coverage, benefits, and treatment costs. Inpatient rehab is where you “check in” to a rehab facility and stay 24/7. You pause everything to focus on rehab for a certain period of time, and eat with others in rehab, do group during the day, and other therapies. Outpatient rehab is living “outside” of the treatment facility, but spending time each week engaged rehabilitation exercises, group meetings, individual counseling session, etc. Detox, or detoxification, is a period of time when one clears the body of toxins or harmful substances. Detox can be dangerous if not managed by a qualified medical practitioner. Once a patient undergoes detox from alcohol or drugs, they are then ready to begin the psychological journey to recovery.